Grown up drinks for grown up tastes: Péché Austin | What are you drinking? About What are You Drinking? The mixology movement has hit the country with full force. Cocktail bars specializing in intricate drinks have sprouted up everywhere. Austin, TX is blessed with several gifted mixologists including the folks at Townhouse that I wrote about previously. If you’re hankering for a bar with a broad menu of classic and inventive cocktails and a refined atmosphere, try Péché in the heart of the Warehouse District on 4th Street. One look at the long, narrow room with wood floors, dotted with polished marble tables, wood beam ceiling and the richly paneled wood bar with antique absinthe water spouts, and your mood will instantly melt into relaxation ready to sip a sophisticated drink. Beautiful Wife and I went there for dinner recently and we were not disappointed by the focus on excellent drinks. Rob Pate, the owner, sidled up to our table the moment we sat down and asked us if we were interested in cocktails. We had barely glanced at the menu of 50+ concoctions of stalwarts like the Moscow Mule, Bees Knees and the Side Car and twists on the Martini and the Manhattan, when we were presented with the delightful opportunity to have an expert guide help us navigate the fun house. Rob asked if we knew what we wanted or if we would like recommendations? Beautiful Wife wanted a French 77. Done. I was open to exploration and only gave the guidance that I was in the mood for bourbon. He recommend a Rye-based drink called the “Final Say” and I was game to try something new for an aperitif. Tip: If you know you are in a bar that really cares about its drinks, put yourself in the hands of the bartender. 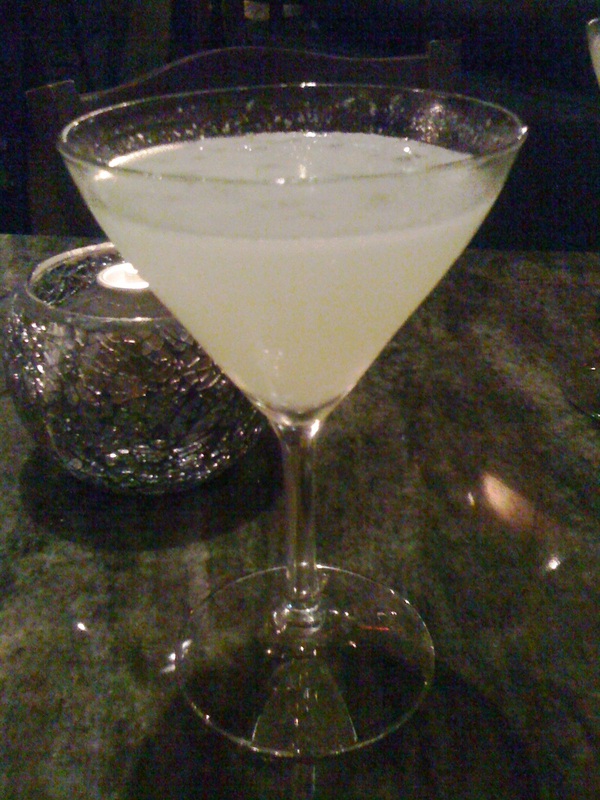 The Final Say is a blend of Rye whisky, green chartreuse, lime juice, Maraschino liquor and orange bitters all shaken vigorously with ice. Look A classic martini glass nestling a misty, pastel emerald with a haze of shattered ice crystals glazing its surface. Smell Pleasing herbal, lime-zest and a hint of honeysuckle like an embrace after he has been drinking Bärenjäger liquor and she is wearing upscale body lotion from a French salon. Taste After the first sip I felt like I was in a British bar car riding on the Orient Express. This is a distinguished drink with lush heather grass tempered by savory lime, and brought to life by the warmth of alcohol. It has a long, sweet finish that obscures the sometimes rough backbone of rye. While Péché has only been open for about two years, Rob is no novice in the restaurant and bar business. His twinkling eyes and complexion ratify a life spent both making and consuming lots of drinks well into the night. He got his start in the restaurant business at the tender age of 15 in summer camp and later worked at the Erwin Center while a student at the University of Texas. He has owned the adjacent Cedar Street bar for several years, but Péché is the first restaurant he has owned. Now we were ready for dinner. Rob explained that his chef du cuisine, Jason Dodd, has a focus on European comfort food with the same commitment to excellence found in the drinks. He sources his ingredients locally and butches his meats in-house. I ordered a rabbit cacciatore and Beautiful Wife chose the carnaroli risotto with applewood smoked Osso Buco. We didn’t need to look at the wine list. Rob came back with a bottle of Domaine de la Pertuisane le Nain Violet 2007, a lovely Grenache nick-named the “The Purple Dwarf” from Languedoc-roussillon, France. It was a lovely mid-bodied wine with plenty of fruit and acidity to pair well with both rabbit and pork without obscuring either. Looking at the list later, it’s exactly the bottle I would have chosen, but I was happy to put the decision in an expert’s hands. The food and wine were excellent. Our waiter challenged Beautiful Wife to finish her sumptuous portion of risotto and pork, which she gladly attempted. She declared that it was the best risotto she’s had and would be dreaming of the Osso Buco for days. After dinner it’s time for a nice digestif. 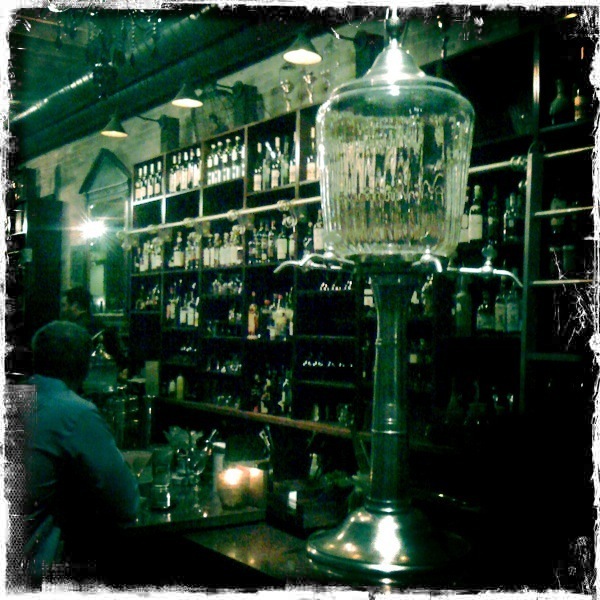 Péché is known as an absinthe bar with nine varieties on the menu. Rob was inspired by drinking a Sazerac in New Orleans, the unique, signature drink made with absinthe. He wanted to bring the distinctive absinthe to Austin to help us enjoy a drink that has long been illegal in the U.S. and widely misunderstood. For my after-dinner drink he chose Germain-Robin Absinthe Superieure, an apple-honey mead brandy-based absinthe made in a small distillery in Mendocino County, Calif. It is served traditionally; mixed with water, but no flame and no sugar to let the full taste come though. Look An elegant Champagne flute filled with the warm glow of breast-milk yellow clouds topped with a creamy ivory mouse. This is an absinthe blanche, meaning it wasn’t infused with botanicals after distillation to give it the traditional green hue. Smell Strong nose of anise and fennel with a mild whiff of lemon zest. Taste The Germain-Robin has a creamy mouth feel and it gently eases into rose and geranium followed by a robust juggernaut of black licorice followed by a velvety junior mint finish. It comes on smoother than Sade and finishes with the cool of a Kool menthol. The haze in the glass will gladly become the haze in your head. I’m embracing the mixology trend. I don’t normally mix complicated cocktails at home because I don’t regularly stock all of the ingredients and don’t have the specialized tools that bring them to life. If you appreciate a well-made drink, whether it’s a classic or a unique original, or you want to have absinthe the way it should be served, try Péché. Grown up drinks for grown up tastes. Stay for dinner. The food is amazing. You can follow their drink specials on Twitter @Peche_Austin.